UPDATE: As of September 17, 2018, this workshop is sold out. Please contact us to be placed on a waiting list, and please look at our other open workshops, thanks. If you’ve ever dreamed of capturing the explosive drama and raw beauty of volcanic landscapes, or wild bears in their natural environ-ment, this is the workshop for you. Our Kamchatka photo expedition takes you deep into the Kingdom of Fire and Ice to some of the most spectacular sights on the Kamchatka Peninsula. The two most potent symbols of Kamchatka’s untamed nature and grandeur— brown bears and towering volcanoes—are the subjects of this eye-opening adventure into the Far Eastern frontier. Hike up some of Kamchatka’s active volcanoes for thrilling shots of steaming vents, acid lakes and smoking craters, and breathtaking panoramas of snow-capped mountain peaks. Cast your lens on an otherworldly ice cave, stunningly desolate lava fields, and the ghosts of forests swallowed up by raging storms of ash. There’s simply no better place on earth to photograph volcanic landscapes than this remote World Heritage listed region. With no roads or railways connecting it to the outside world, Kamchatka is a haven for wildlife. Our Kamchatka photo expedition will get you closer than you ever imagined to the wild inhabitants of the peninsula. 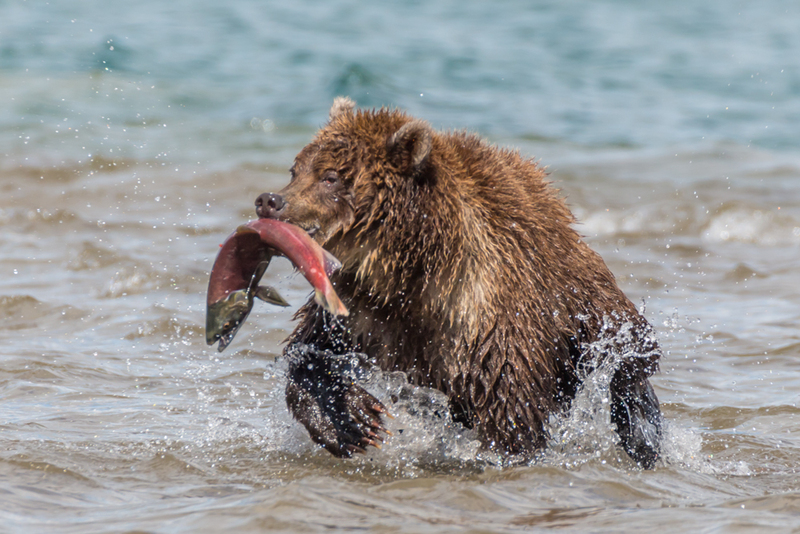 Stay on the shores of the iconic Kurilskoye Lake and take part in some of the best bear photography on the planet, as the bears gorge themselves during the annual salmon run. We wind up our workshop with a full day photographing the vast amount of birdlife and marine wildlife in Kamchatka, in pristine Russkaya Bay. This workshop will suit the active and adventurous traveler. We’ll climb several volcanoes during the trip, although all are easy to moderately strenuous hikes, with no special climbing gear involved. The tour involves a mix of hotel stays, camping, off-road driving, and trekking, with an average height of 1,200m above sea level. This photo workshop is not for everyone! You must have an absolute love for not just photographing the outdoors, but being in it, hiking in it, and yes, sleeping in it! Kamchatka has no real road system, so we'll travel in a 6-wheel drive truck called a Kamaz. Roads can be very bumpy, and two of our rides are 10-12 hours long, with another two that are half of that. In between, we'll travel by giant helicopter. Hiking? There's plenty of it, with hikes on two of our days of 10 and 12 km. Most other hikes are short, 1-2 km. But you must be able to handle uneven ground and remote, sometimes rough, conditions. And you'll need to be able to carry your photo gear on these hikes. Average elevation is 1,200 meters above sea level. Anyone in moderate physical shape with the right mental attitude about this workshop will have a great time! We have a mix of camping in tents and lodgings in hotels. We will travel with our own private chef, photo guide, translator, and at times, armed ranger. August 5, 2019: WELCOME TO THE RING OF FIRE Arrivals in Petropavlovsk (PKC airport code) today, anytime. Petropavlovsk is small city nestled on scenic Avacha Bay; the people here live beneath five majestic volcanoes. After a short tour of the city and one of its photogenic beaches, we'll be transferred to our hotel in Paratunka, a small hot springs resort area located about an hour drive south west of Kamchatka’s capital Petropavlovsk-Kamchatsky. Rest up and prepare yourself for the epic photographic journey ahead! At dinner tonight we'll have a tour brief, and talk about the itinerary in detail, making sure everyone is fully prepared for the workshop. August 6, 2019: INTO THE WILD The expedition begins with a full day's drive to the typical Siberian village of Kozyrevsk and then on to our campsite on the Kamchatka River, the longest on the peninsula. We'll cover a total distance of about 530km on unsealed roads, and takes roughly 10 to 12 hours. Along the way we pass the old Cossack village of Milkovo, where we stop for lunch. Later, in good weather, there's a wonderful view of snowy peaks that make up the highest volcanoes in Kamchatka. We arrive to Kozyrevsk in the evening, and from there our route takes us through the forest, before we finally arrive to the location of our first base camp and our first evening photoshoot at the lake. Today's route is very long drive, challenging, and quite exhausting. We'll be in 6-wheel drive trucks, going over unpaved roads. Expect a bumpy ride. If you are prepared physically and mentally, you'll be fine, as the photographic rewards at the end are amazing. August 7, 2019: MAJESTIC SUNRISE This morning we rise bright and early to take in the majesty of the nearby lake at sunrise. If the weather is clear enough, we'll be able to shoot panoramic vistas of Krestovsky, Ushkovsky, Kluchevsky, Kamen, Plosky Tolbachik, and Ostry Tolbachik. After breakfast at the base camp, we set out on a hike of about 12 km through the forest to a picturesque high plateau. The hike and the photography will take about six hours, after which we'll retire to camp for the evening. 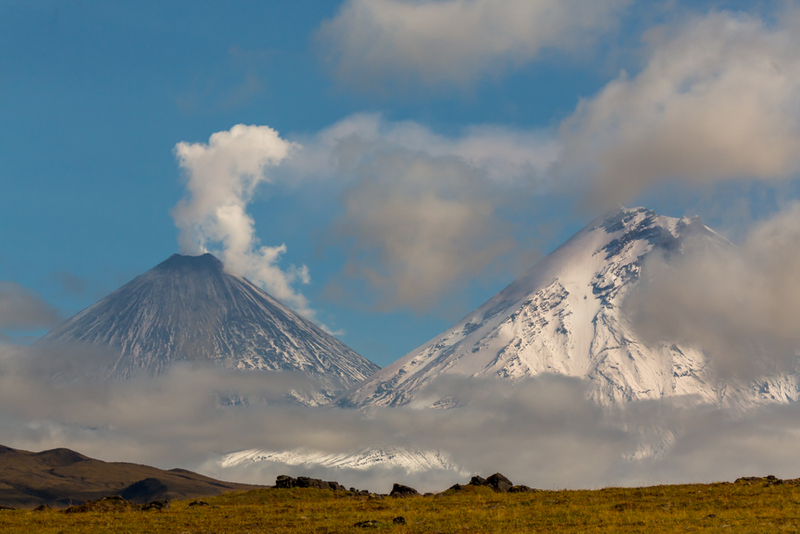 August 8, 2019: TOLBACHIK VOLCANO Today we transfer to another of Kamchatka's most famous volcanoes, the feisty Tolbachik. After a sunrise shoot, we pack the camp and jump into the truck, as we head to our next base camp at the slope of Tolbachik. If weather is clear, we will be able to catch some shots of Klyuchevskoy and Tolbachik volcanoes. After lunch we travel further for three hours, and finally arrive at our second base camp, where we hike to the lava field for evening photography. August 9, 2019: Extra day built-in for additional time at either Base Camp 1 or Base Camp 2. August 10, 2019: THE LAVA FIELDS AND DEAD FOREST After a sunrise shoot in the vicinity of the camp, we head to the Dead Forest, the result of an enormous Tolbachik eruption between 1975 and 1976. The ghostly petrified forest makes a hauntingly beautiful setting for photography. Devoid of life, the ancient larch trees here are now eerie skeletons of their former selves, surrounded by a burnt desert landscape and set against the backdrop of the magnificent Kliuchevskoi mountain range. In the evening we will take an opportunity to photograph the lava fields. August 11, 2019: RETURN TO CIVILIZATION Having spent four days in the wilderness, it's time for a brief return to civilization with a full day's drive back to our hotel in Paratunka. We’ll stop along the way for lunch and to enjoy the Studyonaya River and Milkovo village. Once at the hotel, you can enjoy your dinner, retire for a well-earned rest at the hotel, and soak your bones in the thermal pool. Today's route back to Paratunka is very challenging and quite exhausting. We'll be in 6-wheel drive trucks, going over unpaved roads. Expect a bumpy ride. If you are prepared physically and mentally, you'll be fine, keep thinking of the hot shower and comfy bed that awaits you! August 12, 2019: CHOPPER FLIGHT TO KURILSKOYE LAKE This morning after check-out, we fly by MI-8 helicopter to the Land of Giants, deep in the heart of brown bear country. Our home for the next two nights is Ozerny Camp. It's quite often possible to watch bears fishing along the lake's edge without even leaving the grounds of the base camp. 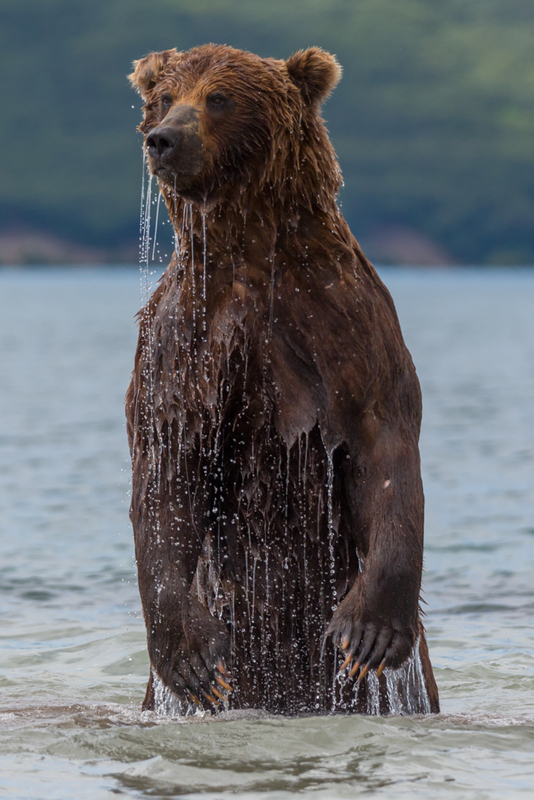 August 13, 2019: MEET THE KINGS OF KAMCHATKA Kurilskoye Lake is without a doubt one of the best places on earth to spot and photograph brown bears in their natural habitat. Our stay here is devoted to photographing and observing these mighty mammals as they hunt the salmon that gather here in the millions during the summer months. On a recent trip, around 100 individual brown bears were seen over three days. The Kamchatkan brown bear is one of the largest subspecies of brown bears, rivalling the famous Kodiak bears of Alaska in size. Photographing these incredible animals in their natural environment is one of the world's great wildlife experiences. The bears are totally preoccupied with fishing, allowing for tantalizingly up-close viewing and amazing photo ops. Safety is assured as we are accompanied by an experienced armed ranger. We'll use a mix of motor boat and walking excursions with experienced local wardens in order to maximize our chances of photographing bears up-close and observing different behaviors. Our walking excursions will lead us to a lush summer meadow where the bears feed on wild berries and visit other spawning streams further from the base camp. Along these streams you'll be able to see the spawning salmon in shallow water and many signs of the large number of birds in the area. There's a good chance of photographing bears fishing only meters away as you walk along the banks of the streams. August 14, 2019: CHOPPER FLIGHT BACK TO PARATUNKA After a final stroll around Kurilskoye Lake, we head up to the bear viewing platform for a final opportunity to photograph the magnificent beasts in their element. Then we board the MI-8 helicopter and head back to Paratunka. August 15, 2019: MIGHTY MUTNOVSKY AND ICE CAVES The people Petropavlovsk-Kamchatsky live less than 30 km from five volcanoes, but they consider these ominous figures to be friendly giants. One of them is Mutnovsky. We’ll take our 6-wheel drive Kamaz and drive about four hours towards this beautiful giant. If the weather is clear, we will make some stops along the way for different photo ops. The entire massif comprises four cones of the volcano. On the top of this mountain, you can see a big snow-white glacier, a little sulphur sandy river, and the biggest femoral field in the world. After a rest, we turn our lenses on Mutnovsky's hidden gems; ice caves, sculpted by eruptions and shifting glaciers. Our guide will lead you deep inside an extraordinarily beautiful and rarely seen ice cave, where dazzling rainbow hues appear to light up the walls, created by reflections from an underground river. Only discovered in 2012, this ethereal place is the scene of some of the most mesmerizing images of volcanic landscapes ever captured. We'll also photograph two nearby waterfalls and other photogenic landmarks in the area. It is important to know and remember that the ice caves may be not available to us if weather conditions are unfavorable. August 16, 2019: MUTNOVSKY'S CRATER Now it's time to tackle the mighty volcano head-on with a hike to its steaming craters. Near Mutnovsky's 2,322 meter summit is a nest of merged craters, among the most beautiful volcanic phenomenon in Kamchatka. We hike to the rim of the craters via a crack in the volcano's side. This hike will be approximately 5 km. With a bit of courage, you can climb to the crest of the craters. Standing at the top, on the edge of the deep cavity, you feel as though you're witnessing the earth's creation, gazing down upon glittering glaciers, the torches of sulphur spewing fumaroles far below and the columns of vapor rising from the active funnel crater. As our local guide says, "Mutnovsky volcano is the heart of Kamchatka. This heart is literally beating and you can feel it, while the earth is slightly moving under your feet." Reaching the craters involves a moderate, half a day hike (including photo stops). After dinner, we will be able to take some evening photos at the vicinity of the camp. August 17, 2019: ROUTE BACK TO PARATUNKA With all of our hiking done, and lots of first-rate photos in tow, it's time to return back to Paratunka. En route we will visit a waterfall in Opasny Canyon. August 18, 2019: CRUISING ON RUSSKAYA BAY Very early in the morning, we are heading out from Paratunka to the Petropavlovsk seaport. We'll spend the entire day cruising the wildlife-rich waters of the bay, a remote and spectacular cove on the south-western side of the Avachinsky Gulf. Regarded as one of the most pristine natural areas in the region, Russkaya Bay resembles an Arctic fjord, with crystal clear waters ringed by forested hills and snow-dusted mountain peaks. As well as taking in the scenery and serenity of the bay, we'll be on the lookout for Russkaya's wild inhabitants in the air and sea, including seals, sea lions, otters, Steller's sea eagles, and an abundance of fish and birdlife. With a little luck, we might even be able to witness whales and orcas breaching the surface. During the trip, a lunch of fresh fish will be served for you. In the evening we are heading back to our hotel in Paratunka. August 19, 2019: FAREWELL TO KAMCHATKA It's here that our expedition ends. Flights home from Petropavlovsk anytime after 9:30 AM today. 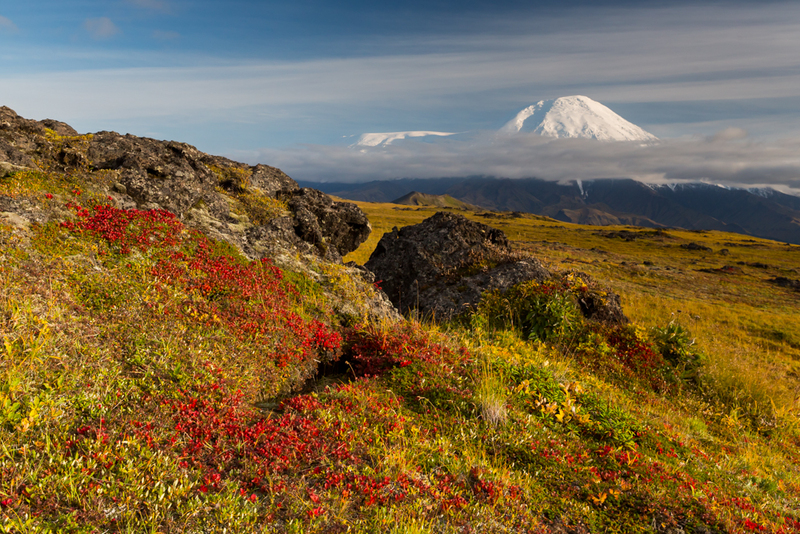 WEATHER: Kamchatka's climate is as diverse as its flora and fauna. The peninsula experiences the four seasons of the northern hemisphere with warm summers and cool winters but there are as many as 20 distinct climatic zones which vary not only according to latitude but also proximity to the sea and even geo-thermal activity. All this makes temperature and rainfall very hard to predict. You can expect daytime temperatures to be in the region of 10–25° C (50–75° F), but overnight at our highest camps the temperature may drop slightly below freezing, to -5° C (23° F). It can be humid in some areas of Kamchatka, and there can be lots of mosquitos (at Tolbachik volcano area for example). During your stay you can expect rain showers and even light snow (in the mountains). 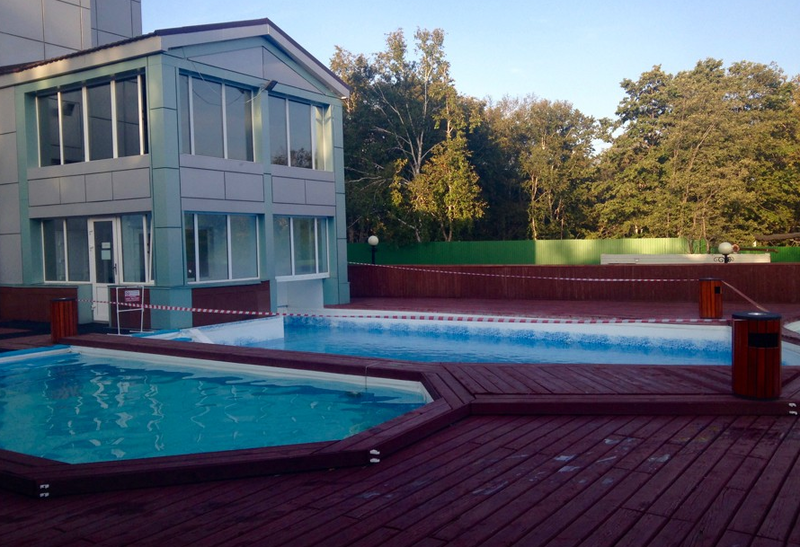 HOTEL IN PARATUNKA: Tourism infrastructure in Kamchatka is very far behind modern western standards. Almost all the hotels were built during the Soviet era and have inherited many of the Soviet features, but despite this, all the hotels are crowded in summer and get booked out very far in advance. The hotel we have chosen for the tour is Hotel Bel-Kam, which located in a quiet beautiful valley of Paratunka, surrounded by hot springs. It is clean, safe, and comfortable. MOSQUITOS: Expect that there will be mosquitos. You should have plenty of mosquito repellent and a mosquito net for your head. BASE CAMPS: Our first five full days at Base Camps 1 and 2, we are in small tents, one person to a tent, and you are sleeping on camp sleeping mats, with your sleeping bag, sleeping bag liner, sleeping pad, and pillow. During our stay in the base camps at the slopes of volcanoes and at the Ozerny base camp on Kurilskoye Lake, we’ll be in large tents, which accommodate 5-6 people, and we sleep on folding cots, and your sleeping bag and pillow. There are showers, sinks, and toilets in a separate building nearby and a big “kitchen” tent. SLEEPING GEAR: You will need to bring your own sleeping bag, sleeping pad, bag liner, and camp pillow. The sleeping bag should be rated for 20-30°F (-6 to -1°C) temperatures, here’s an example of a sleeping bag that should do fine in the temperatures we are expecting. For something a bit more substantial, here’s one that Andy owns and uses And here is a sleeping pad. For a pillow, we can recommend this one , and for the liner, this is a good option. You will use these items for 8 of the nights so it’s an important thing to consider and get right. We do understand that traveling with this extra gear isn’t easy. A sleeping bag and mattress can be rented for you in Kamchatka, at a cost of $60 USD. If you rent, you will still want to bring a camp pillow and sleeping bag liner. Air travel from your home to Petropavlovsk, Russia (PKC airport code), and back. Passport and visa fees (you will need a Russian Visa, we will advise how to get this). Any meals and accommodations before or after the workshop dates. Medical Evacuation Insurance (required). Travel Medical and Trip Cancellation Insurance (optional, but recommended). Sleeping bag, liner, and sleeping pad. Tips for local guides and driver. Items of a personal nature. Alcoholic beverages. Anything not specifically listed as included. Your non-refundable deposit of $4,995 will hold your place on this workshop. Further non-refundable payment of $5,000 is due on December 1, 2018. Final non-refundable balance payment is due by April 1, 2019. All payments are non-refundable and this is why we recommend comprehensive travel insurance including trip cancelation. All of our other standard terms and conditions apply. If you're ready for beautiful volcanic landscapes, close-up wildlife photography, and an amazing travel experience, click the "Sign Me Up!" button now and reserve your spot. This workshop is only for eight guests maximum and it will fill up fast!